Can "Botched" Doctors Help Patient With Ginormous Lips? | E! 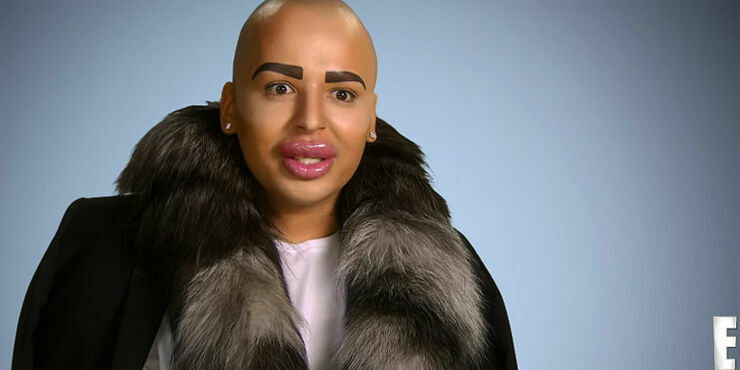 Remember that British guy who spent $150,000 on plastic surgery to look like Kim Kardashian? Well, it hasn't boded too well for him, in fact it seems to have gone very, very badly indeed. After throwing a vast amount of money at his looks, his inflated lips have started to leak. And because of the amount of lip injections and botox he's had, he can no longer really move his face either. Not sure that's a trait of Kim K, but still. So he appeared on TV show Botched to see if they could help. However, even though his face is effectively f*cked, his main concern isn't getting it back to normal, but concern for losing his huge lips, "I can’t really move my face." he says in the video. "I want just a little bit of definition and they just got bigger and bigger but any attention is good attention. I’m worried if they keep leaking I’m going to end up with small lips again."